Su Yun’s Chinese Learning Center advocates innovative, engaging, and effective Mandarin learning. We’ve organized our space into stations to support the project-based learning approach that we believe is an effective tool for learning Mandarin for young learners. Here, children learn and practice their pronunciation and writing in Mandarin, as well as develop their thinking and articulating skills. We use worksheets, flash cards, games, etc. to strengthen the learning of new words (pronunciation and penmanship) and narrative skills (story elements and thinking strategies). To break and to make. Here on the maker-space workbenches, students take apart, observe, examine, and discover new possibilities. They learn circuitry, robotics, basic coding, and use paper engineering, lego robotics, and 3D printing to create new solutions. We will introduce science fairs and the latest STEM practices, but our focus will remain on learning Mandarin through these fun projects. Here, we focus on arts and crafts that facilitate STEM projects -- paper engineering (e.g., origami and pop-up cards), papertronics (circuitry of simple light and sound), paper automata (paper crafts that move), and of course the good old painting, gluing, and making of arts and crafts. In light of the importance of STEM on K-5 education, we merge the learning of narratives, visual, and engineering together in our lesson units as students begin creating their projects. This is where the popular kitchen science will take place, for example, fruit battery, molecular gastronomy (sticky slime, invisible ink, etc. ), and other fun food sciences. The variety of our stations includes an animation station (for claymation and stop-motion) and a sound studio with piano, electric drums and electric guitar. These instruments are used to add drama and help tell the story created with claymation and stop-motion. Some of the projects exiting the Arts & Crafts or Maker-Space Stations may enter here for fun presentational purposes: to turn the paper automata or lego robotics into a stop-motion animation with authentic Chinese drum rolls on the soundtrack, for example. Student projects will all come here for final presentations, as a sounding measurement of their learning result. Using chromakey screen, theater stage, or video screen, young children will have a chance to practice public presentation skills, theatrical performance, or multimedia showcase. They will also learn the proper presentation skills for these different occasions, all in Mandarin. This multi-functional space is used for viewing videos, stage performances, project presentations and events to be held in front of an audience. 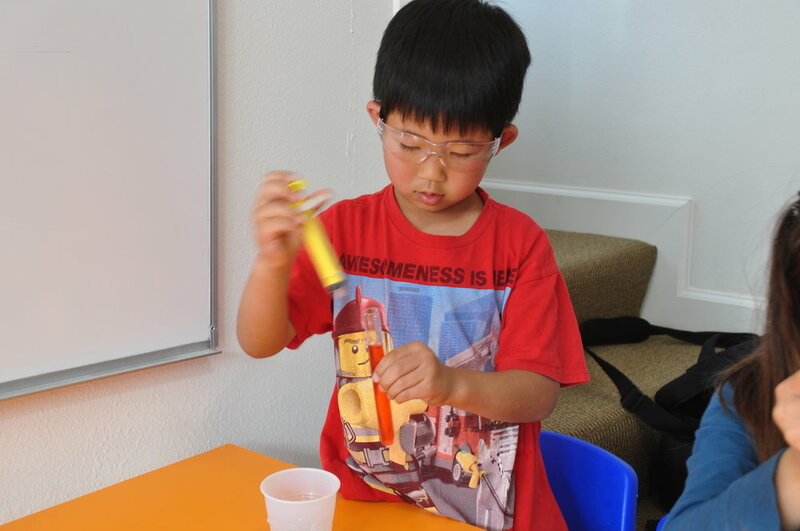 It is also used for hands-on science experiments, cooking demonstrations, etc.